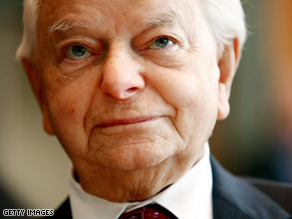 Sen. Robert Byrd was released from the hospital Tuesday after a six week stay. WASHINGTON (CNN) - Sen. Robert Byrd was released from the hospital Tuesday, after a six week stay that kept the 91-year-old West Virginia Democrat away from Capitol Hill. A statement from Byrd's office said that he is "resting comfortably at home, where he will continue his recuperation and physical therapy." The statement did not say when the senator would return to work. The Senate is currently in recess for the Fourth of July holiday. Byrd was hospitalized on May 15 with an infection and was expected to return to work after a few days. But the Senate's longest serving member developed a staph infection while being treated for his original infection. Previous statements released by Byrd's office indicated that he was "resuming some of his official duties while recuperating, including signing several … bills as president pro tempore of the Senate, and working with staff on upcoming appropriations bills." Byrd served in the House from 1953 to 1959 and moved across the Capitol to the Senate in 1959. If he were a typical 91 year old senior he would not have been allowed to be in the hospital for 6 weeks. They would have sent him to a nursing home to recover since Medicare or even the supplimental insurance some seniors can afford wouldn't allow such a long hospital stay. With that said, I remember President Obama promising each American would get the SAME insurance that their representatives got in Congress. We shall see Mr. President will we? Hey Byrd ... time to fly away ... far, far away from the Senate. Give it up, old boy! We have term limits...they are called ELECTIONS! If the senator or representative is not doing a good job, then don't re-elect them. If they are doing their job, then keep them. Obviously, we do have gerrymandered districts for the House, but Senators are elected by the whole state, conservative and liberal districts. The people in WV can keep Sen. Byrd as long as they want. He will eventually pass away, as all humans do, but if the people of WV want to reward him by keeping him in the senate as a figurehead then let them. its nice to hear he is better, but how and why is he still serving in the senate? byrd is a good argument for why we need term limits. 50 years? even the president can only serve for 8 yrs. it is time for the senator to retire. He was in the hospital? I agree that Byrd should resign and should have a LONG time ago. He's tying up a job that someone younger could use! All of these senior citizens who don't HAVE to work should retire and give these jobs to people who NEED them! Senator Byrd was elected fair and square. If he wasn't worth voting for he would be retired and by my calculations that would have put him, what – in his 80's last time around? Last time I checked we still vote in this country. People are clamoring for change all over this country but I don't see more youthful people being as dedicated to their nation as Sen. Byrd. Quit whining for someone to fix the problem and become part of the solution. Join the Army today! Sorry, little bias there. With all due respect...this man is TOO OLD to be in politics. I'm sorry, but too old is too old. Can't this guy retire and take up some cause besides babysitting the Senate? I like the guy. But he 91 and trying to be strong, but he has to give it up. Term limits are in order. God Speed Mr. Byrd. Come on back home and enjoy the mountains for a while. You've done your part. He lived long enough to see his boy-'hood' dream come ture courtesy of the Democrtic party and the Democrat voters who support them. Without their division tactics, we may have been very very close to Dr. King's dream by now. It would be a pity if he has a flashback of one of the blazing "grand old parties", and I'm not speaking of the GOP. If Mr. Byrd were not a Senator and Obama's healthcare plan was in place, he would not be alive since there will be rationing based on age, not on contributions to society. I wish the man no ill will. Its sad that he won't return the favor, and resign. Ultimately, its all about whose needs are being met. Mine, or his. Clearly, he cares more about himself. Meh. He may be more conservative than most Democrats, but I like his enthusaism. There are mandatory retirement rules in nearly all industries and public service. Can't we impose the same rules on politicians that our own bosses impose on us at work? Sen. Byrd is old, but he's not stupid. He was one of the few in the Senate who stood up in 2002 and said that invading Iraq is a really dumb idea. 91 is probably time to hang it up though. If there ever was an arugment for TERM LIMITS. This OLD COOK and Teddy (I'm sober now) Kennedy should resign or be "recalled". If he were a commercial pilot he would have been FORCED to retire many many years ago. Retire and let some forward thinking person have a chance. How much more "sick" time do you have left this year from your "job" before YOUR employer terminates you like would happen to us in the same predicament. WE DON'T get unlimited time off for sickness, why should you??? One big, big benefit of Byrd retiring at his age would be .... he won't be around for very long to collect that great pension senators receive (plus medical benefits).